Building a big hop growing scene in Nebraska could be huge for the state. They could at least make enough to refurbish this dilapidated barn. Don’t look now, but Nebraska’s brewing scene is getting ready to make a name for itself. Sure, the state already had some great brands like Zipline Brewing Co., Empyrean Brewing Co., the Nebraska Brewing Co. and so on, but no industry can truly scale up and hit that higher level of prominence without help and encouragement from the state. This is why Nebraska is poising itself for a leap — the state is wising up and both rolling back regulations where appropriate and incentivizing behavior in other areas to encourage the growth of local craft beer. This all started with changing the law that would force a brewery to close its taproom or restaurant if its production exceeded 20,000 bbls a year. Kudos on that. That would probably be enough to help grow the craft beer scene, but the state is looking for this burgeoning industry to help boost one of the state’s mainstay industries: agriculture. Last year the Legislature passed another measure supporting the craft brewing industry — creating tax credits for brewers who use Nebraska-grown ingredients, like barley or hops. Brewers like Caleb Pollard of Scratchtown Brewing in Ord said they haven’t taken advantage of that mostly because the supply isn’t there yet. But several people are working to change that, including University of Nebraska-Lincoln horticulturalist Stacy Adams. Nebraska has more clay-heavy soils, but also more wind, good for keeping humidity down. Under a recent grant from the Nebraska Department of Agriculture, Adams has launched a new hops research project. He’s selected eight hop varieties he knows craft brewers want to use — like Willamette, Pearl, Crystal, and Chinook — to grow on test plots in four places around the state with different climates and soil types, to evaluate their performance over time. “We want to see if there’s some consistency in the productivity. Given our environment is somewhat volatile, we want to identify varieties that the farmer will be able to market. ‘Cause the brewers are mainly looking for consistency from year to year to year,” Adams said. This year’s bill also created the Nebraska Craft Brewery Board to support research, marketing, and promotion of Nebraska brewing and agricultural products used in beer production. Nebraska brewers said they’re encouraged by support from the state and university. Because, Kavulak said, it’s not about drinking. “This industry represents jobs. And it also represents an investment in our people and our culture. So we [the Legislature] look for opportunity to help industry grow and to bring more people into our state,” [State Senator Colby Coash] said. Nebraska brewers and hop growers are planning their first joint meeting in January 2017 to plan how they can work together to continue to craft award-winning Nebraska beer. 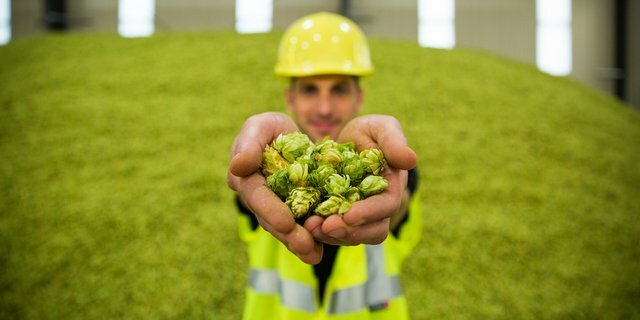 The state is now also home to its first commercial hops processing facility, which is another huge key in this whole equation. Read that entire feature on NPR Nebraska for more insight into how the brewer/grower alliance is taking shape in the state. Derek Richards liked this on Facebook. Shad Clarke liked this on Facebook. Trevor Lee liked this on Facebook. Brian D. Thompson liked this on Facebook. Larry Johnson liked this on Facebook. Edward Penniman liked this on Facebook. Guy Lewis liked this on Facebook. Ben Matya liked this on Facebook. Lisa Pedersen liked this on Facebook. Tenise Schmaljohn-Jarecke liked this on Facebook. Karen Kollars liked this on Facebook. Rick Nelsen liked this on Facebook. Mike Klimek liked this on Facebook. Jason Hines liked this on Facebook. Seth Yount liked this on Facebook. Lindsey Hayes Clements liked this on Facebook. Jeff Bender liked this on Facebook. Jeff Oberg liked this on Facebook. Tom Wilmoth liked this on Facebook. Abigail Frank liked this on Facebook.